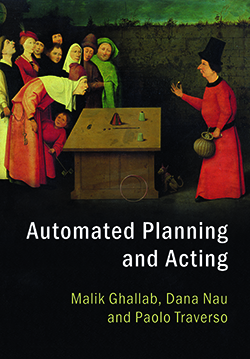 Professor Dana Nau’s (CS/ISR) new book, Automated Planning and Acting, is defined by collaboration. The book reunites Nau with colleagues and co-authors Malik Ghallab (Laboratoire d'analyse et d'architecture des systems) and Paulo Traverso (FBK-ICT IRST), the trio that produced 2004’s Automated Planning, published by Morgan Kaufmann. Published by Cambridge University Press in August, and available in both hardcover and electronic versions, Automated Planning and Acting introduces "complex computational techniques for planning and performing actions" to graduate students and others interested in this area of artificial intelligence. Four years of collaborative work, and much lively discussion, went into the making of the book. The result is “a research roadmap,” said Nau. The three AI automation and planning experts decided to challenge a few suppositions in the AI planning community. One aspect of planning that Nau hopes readers especially notice is the need for the planning community to remember that all actions for an intelligent system take place in a dynamically changing world. It is difficult to assume perfect deterministic action when setting out to achieve an objective. The book, which includes problem sets, will be especially useful for graduate AI planning courses. The book also will give students a chance to learn a bit of art history, as they may spend time determining why the authors settled upon a Hieronymus Bosch painting, “The Conjurer,” as the cover art. Autonomous AI systems need complex computational techniques for planning and performing actions. Planning and acting require significant deliberation because an intelligent system must coordinate and integrate these activities in order to act effectively in the real world. This book presents a comprehensive paradigm of planning and acting using the most recent and advanced automated-planning techniques. It explains the computational deliberation capabilities that allow an actor, whether physical or virtual, to reason about its actions, choose them, organize them purposefully, and act deliberately to achieve an objective. Useful for students, practitioners, and researchers, this book covers state-of-the-art planning techniques, acting techniques, and their integration which will allow readers to design intelligent systems that are able to act effectively in the real world. The book covers a wide range of different techniques, their pros and cons, and how they can be used effectively in different real-world applications. It presents state-of-the-art techniques for planning, and how to integrate these techniques with acting to design intelligent systems.